Pink Lemons, they really do exist! Variegated Pink Lemons are one of nature's greatest "little happy accidents". The Variegated Pink Lemon is also known as a Variegated Eureka Lemon, because they were discovered growing on their own small branch or "shoot" on a regular Eureka Lemon tree. What can you do with pink lemons from Pearson Ranch? Anything you would do with any ordinary lemon. So, in reality you really can make "honest to goodness" pink lemonade without having to use chemicals or a container of store bought pink lemonade "crystals" with "who knows what" lurking inside. They taste like regular lemons, have a similar shape of lemons, but both inside and out they sure look a whole lot different. 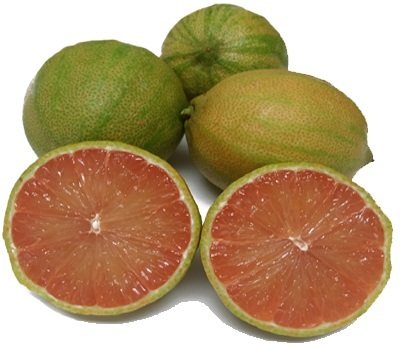 With their green and white stripes on the outside and their light rosy pink color on the inside, these pink lemons are sure to please the exotic fruit lover in all of you. So add a whole new twist to your regular kitchen "must have" of lemons, and let's get cooking! When are Variegated Pink Lemons available? **Pink Lemons are (typically) available most of the year HOWEVER...due to the very high demand of Pink Lemons, your order will be shipped to you based upon their availability at the time you place your order. How many pounds of Pink Lemons do I get in a box? Pearson Ranch sells it's Pink Lemons in 5 pound Quantities.